Senya lets you design OpenAPI 3.0 and Swagger 2.0 specifications fast and effectively. Smart completions help you to quickly design a new specification. Specification validations save time tracking down errors. 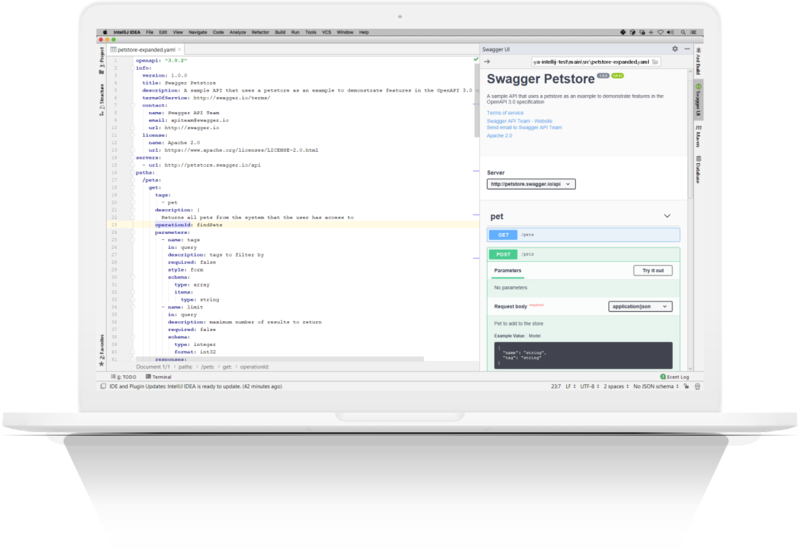 The Swagger UI preview window offers a sneak peek at the API documentation. Finally, with just a click you can navigate to referenced files in and outside the current project. Type less with completions for: JSON references, media types, HTTP status codes and property names. For property name completions, Senya also inserts a property value template. It determines the value type and includes required properties and constant values where applicable. This is a great time saver, especially when you're editing JSON. Without error highlighting and proper validation fixing errors in a large or highly modularized API specification is like finding a needle in a haystack. To combat this, Senya offers validations for all required fields and musts defined in the Swagger 2.0 and OpenAPI 3.0 specifications. The Swagger UI preview lets you quickly switch back and forth between viewing the API documentation and editing the specification. While you edit, the API documentation is updated in real-time. Quickly navigate through multi-file specifications. Simply 'CTRL + click' a JSON reference to access the referenced file. Files in the current project or on the local filesystem are supported.